Koo Jeong A’s installation ARROGATION (2016) is a skate park designed for public use that can be seen from inside the Bienal Pavilion. 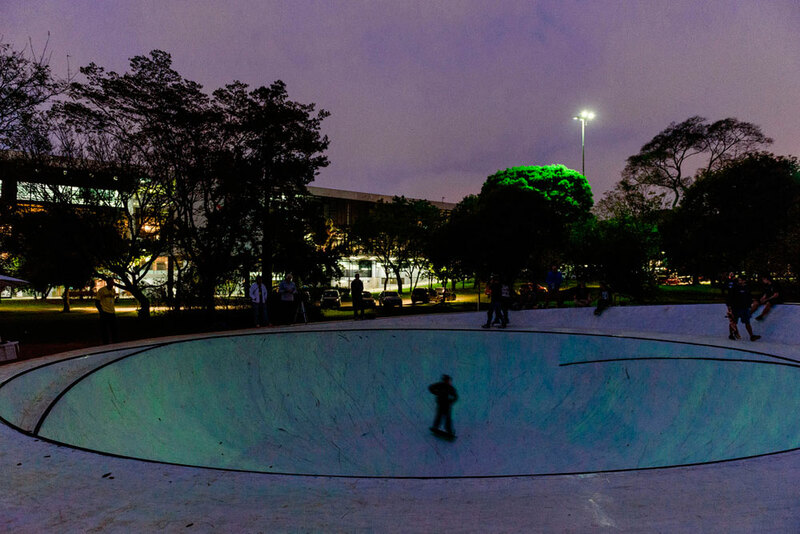 Built in the Ibirapuera Park, the skate park phosphoresces every night, inviting skateboarders’ to experience a different kind of space. Having previously designed two skate parks, the artist is drawn to their sculptural form and their ability to promote human interactions and combine different contexts. In her investigation for the piece, Jeong A examined the transition of light during sunset. The skate park changes colour as in the twilight, providing a live and mutable dynamic to the concrete structure. The skate-park’s shape derives from one of her drawings, in which two circles are juxtaposed, suggesting a continuous spiral. In general, Jeong A’s works intend to provoke experiences that overcome rationality and cognition in order to activate the present and the sensibility. Her practice includes installations, videos, sculptures, and drawings.